Sure, you could join a regular dodgeball league, but you know what’s more fun than throwing balls at people? Throwing them at people while bouncing on a trampoline. By day, House of Air is just your regular trampoline park inside a vintage Presidio building off of Crissy Field. By night, it’s home to the adult trampoline dodgeball league. 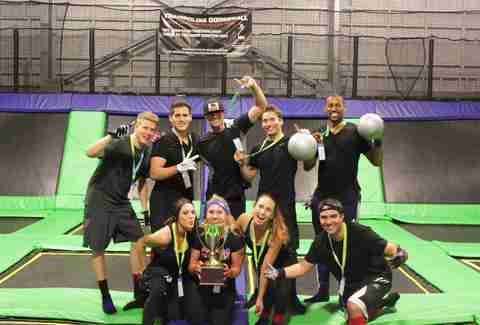 Eight teams of eight play three games each week for a seven-week season that determines the trampoline dodgeball champion. Warning: bouncing is surprisingly exhausting, you’ll be feeling this in more ways than one come Wednesday morning. Underwater Hockey isn’t really anything like hockey, except there’s a puck and goals. Played underwater, the game uses fins, snorkels, and small sticks to push a puck around the bottom of the pool. The six-player teams are co-ed and the most-dedicated compete at a national and international level. All you need to get started is a swimsuit but, yes, you’ll need to practice holding your breath. More violent than regular polo and slightly less expensive, bike polo is sort of what it sounds like -- the semi-ancient and very serious game of polo, but on bikes instead of horses. 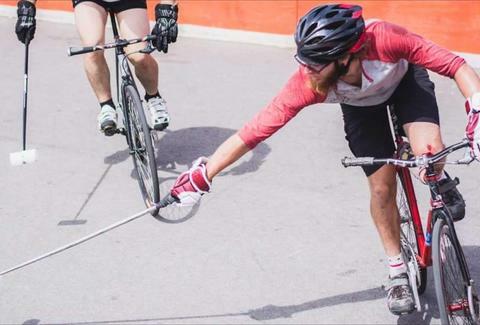 In fact, bike polo allegedly dates back to the 1890s. In San Francisco, the bike polo league got an official home in Dolores Park when a new court opened there last year. San Francisco Bike Polo plays four night per week. (Wednesdays are for newbies.) But there’s also a long-running league in Oakland and a group that plays in San Jose. Cruise around town and you may be able to find a pick up game, just bring your own mallet. You’ve seen it on TV during the Games in Rio and maybe got weirdly fascinated by the athletes sweeping the ice. Now, it’s your turn to try the great sport of curling. The Bay Area Curling Club puts on intro-to-curling clinics at the Oakland Ice Center and, occasionally, in San Jose. You can also take lessons. Or just put together a team and join a league. There are weeknight, weekend, and doubles leagues of varying degrees of ability. Who knows? Maybe curling could be your thing -- though you’ll have to go somewhere where it’s actually cold to play out in nature. Why limit yourself to just one game when you could play a different game every week? Especially if those games are remnants of your childhood recess, the best class period of the day. With three different divisions and team sizes (up to 20 people), Play Recess teams face off in a new competition each week: kickball, dodgeball, scavenger hunts, king of the hill. The evening’s activities are followed up with a tough game of flip cup -- which you probably didn’t play in school. “Base Ball” isn’t a typo, that’s just how it used to be spelled. This league is all about anachronistic integrity, following vintage rules and gear guidelines from 1886. That means seven balls for a walk, 12-person teams, and the requirement that you call the umpire “Sir.” Teams in San Francisco, the East Bay, and San Jose take the sport seriously and consider it more than a historic reenactment. Practice starts in January and the league season begins in March. 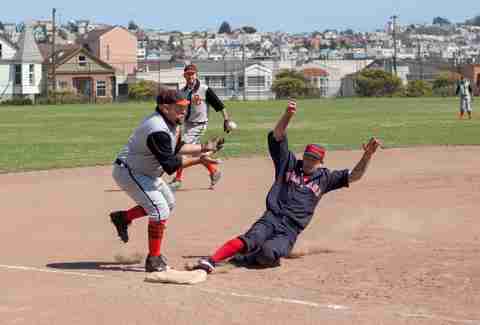 Contact league organizers to find out about fielding a team or to try a more casual fall game designed for newbies. It may be a made-up game from Harry Potter, but it’s very real for the many, many players of the many, many clubs around the Bay Area. You don’t get to actually fly, but you do get to run around with a broomstick between your legs and try to throw a ball (called a quaffle) through three hoops, while other players try to hit those balls (and you) with other balls, while another player called a Seeker looks for the snitch... Uh, well, if you haven’t read the books it’s a bit complicated. There are a bunch of teams that play regularly in Silicon Valley and compete in tournaments. Check out the Silicon Valley Skyfighters, Silicon Valley Skrewts, or the Palo Alto Mission Blues -- we bet at least one of those teams has a technologist who’s looking into that whole flying thing.